RunGunJumpGun is a tough as nails 2D Action Platformer that puts a teeth-rattling, gravity-defying weapon in your hands. 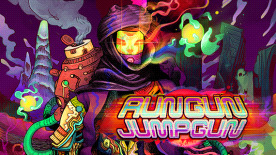 With a cast of crazed characters, simple but beautifully difficult gameplay, and a pulsing musical score, RunGunJumpGun is a loud, trippy mess of twitchy platforming goodness. The two-button setup is treacherously simple. One button shoots your massive gun downwards, propelling you through the air. The other shoots forward, destroying anything that's in your path. But there is no stopping in this beautifully surreal world littered with deadly traps and soul-crushing obstacles around every corner. Players will have to constantly alternate between the two firing modes to maneuver through meticulously crafted levels where death is a promise not a possibility. There is only running, gunning, jumping, and gunning, in a mad dash to survive long enough to die again. The game takes place in the Extax System, a solar system where the Sun has begun to swell and devour planets. With most of the planets already devoured, the remaining worlds have descended into madness and superstition. Each denizen has their own theory on why the sun seems so enraged, but they all hang on one central element: Atomiks, the primary resource in the entire system. You play as a scavenger, a rogue from outside the Extax System who seems to have only one goal: get Atomiks. What do the Atomiks mean to the scavenger? Does he want to scoop up precious resources for himself, or use them as a way to appease the sun and end the suffering of the system? Or Maybe they're just shiny pick-ups in a video game to him. Two button gameplay: One button lets you fly, the other blasts obstacles into heaps of rubble. Over 120 levels of Mayhem: Each level is meticulously crafted to hone and test the player's speed and tenacity. Marathon Mode: For players looking to compete for the global high score. Hyperkinetic soundtrack: Pulsing musical score blending hip hop, electronic and movie-score vibes. Warped space-opera narrative: The game features a cast of crazed, beautifully illustrated characters. Masochistic Collectables: The quest to collect "Atomiks" littered throughout levels lends an extra level of insanity to already merciless level design. A gift to self-hating completionists. Accessible single-hand gameplay: Appropriate for players with disabilities. Made by free range developers fed a pure mixture of VVVVVV, Hotline Miami, and Super Meat Boy.